If you want to see a relic of sports history, dust off a copy of College Football USA '96. In its final season, the old Southwest Conference appeared for the first and only time in a video game. The next year, four members split to form the Big XII. This game is one of the last places you can still see the SWC logo. The reason is loosely related to this week's news—dropped like a bombshell, but still laying there like a dud—that the NCAA would no longer license EA Sports' college football video game. The two had been partners since 1998, but it wasn't then, and it still isn't, the NCAA's seal of approval that has put all of these schools, stadia, bowls and fight songs in a video game for nearly two decades. College Football USA '96 already had most of this stuff, being the first video game to feature every Division I-A team at the time. Two years later it was reborn on the PlayStation and PC as NCAA Football 98. 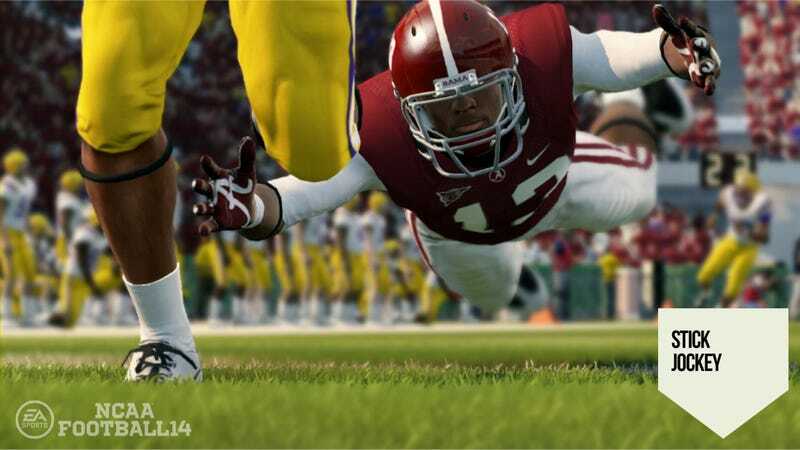 EA Sports supplied the improved graphics, better animations and AI, and a multi-season dynasty for the first time. The NCAA added, at a cost of half a million dollars, its name and a logo. That's it. That is all the NCAA has ever done for this game. Why? If EA Sports already had all this stuff—and if the NCAA's license was purely cosmetic—why pay $545,000 a year for that? Well, know what was released seven months after NCAA Football '98? NCAA March Madness 1998, by EA Sports. This week I was told, by someone very knowledgeable with how the college football series was licensed, that the only reason EA Sports sought the NCAA license was to get at the symbols the NCAA did own—March Madness and Final Four, principally—for its college basketball debut. It was, apparently, a package deal. Buy NCAA for football, get NCAA for basketball. EA Sports canceled the NCAA Basketball series four years ago. That's why no one was panicking at Electronic Arts, much less inside EA Tiburon. The NCAA's gone? So what? "EA is probably thrilled," said my source, as it saves them half-a-mil in royalty money that didn't do anything for the product it was making anyway. If EA Sports was still making a game with the Final Four in it, then you'd see panic. The day everything didn't change. But you couldn't tell this by the initial reaction (mine included) as people tried to sort out what it all meant. Then folks realized that a third, private company handled the licensing for everything that makes the game compelling, from the Heisman Trophy to the Belk Bowl (check that, the Belk Bowl makes nothing compelling, but you get the idea). This body, the Collegiate Licensing Company, is the name that matters, even if this year's game isn't called CLC Football '14. So nothing changed, but there are some who wish to pretend something has. The NCAA would like you to believe, despite its insistence that it never licensed student-athlete's likenesses (technically correct, even if they were used in a game it approved) this is now time for its members to consider their appearance in this game. "Member colleges and universities license their own trademarks and other intellectual property for the video game," the NCAA said in a statement. "They will have to independently decide whether to continue those business arrangements in the future." Well, baloney, the NCAA is getting out of the licensing business because it's being sued by current and former players over the fact their image is on a lot of stuff that makes the league and its members a lot of money, and even if the case is an existential threat to video games, they're only a tiny sliver of the pie. It's damage control, of the kind that generally involves locking a barn after the livestock has fled. Some schools—notably Kansas and Stanford—gave statements they want to "examine" or "digest" what this all means. That's very responsible. Kansas is not a defendant in any of these suits. Stanford is not a defendant in these suits. No university is named as a defendant in these suits. The organizations they belong to, sure, and the big wad of TV money they get from it is at stake. But the universities aren't, mostly for logistical reasons, but also because suing more folks doesn't increase the potential damages. O'Bannon's legal team was quick to jump on the news, as well they should, but even then I don't think this is as much of a game-changer as the dramatic tone would suggest. "Our suit illustrates how the cabal between the NCAA and EA has exploited student athletes for years, using their images in video games without compensation," Steve Berman, co-lead counsel in the O'Bannon suit, said in a statement. He has a point but I'd argue that while these players may be identifiable by many different traits, they are not identifiable without their uniforms and helmets—things that the NCAA has nothing do with. I don't understand why, if everyone insists they don't license college players' likenesses or use them, either Stanford, Kansas or anyone would face more exposure without the NCAA's imprimatur on this video game than they did with it. The only exposure that's created is if a school drops out of the CLC but then chooses to license a video game on its own, which would be a profoundly stupid move. They're better off staying aboard and taking the payday, which I think they did as on Friday, the CLC announced a three-year extension to the deal with EA Sports, noting that it brings along everything we've seen in the game to this point. Though some are speculating that schools are dropping out or have done so already, I'm interested to know where that's supported. If a school drops out of the CLC, they have to go all the way out, and I do not see a major university with a huge alumni base doing that. And if one or any of them now have a moral objection to the profits created by the ethically greasy, legally questioned, but damn-right-it-is a use of their students' likenesses without their consent, then my question is, why now all of a sudden? What changed? Nothing changed. Nothing will change, not until a judge, jury, or the threat of a billion-dollar class action lawsuit forces the NCAA and the CLC to change—profoundly—how they license and administer these video games and television broadcasts. And next year, as EA Sports slips back into an old sweatshirt it's kept in the attic for the past 18 years, College Football 15 will still have everything the series has had since College Football USA '96. Except the Southwest Conference won't be in it. Top image by Kevin26385 via EA Sports.